I don't like Rich Lowry. I think he's a smug, self-satisfied jerk. But today he wrote something that makes sense. He writes for the National Review, a festering pool of "conservative" neanderthals. Sometimes his columns get printed in our local paper. I have pretty much given up on reading anything he writes, but today I did, and today he hit the nail on the head. Hirayama: This is my one and only pupil. Ogura (the pupil): Ogura at your service. Shinzaemon Shimada (chief): Are your parents still alive? Ogura: Father died two years ago; Mother passed when I was five. I come from a lowly family serving a noble's concubine. Since deciding to live for the sword, I've waited for this day . . . to use my skills for society. Allow me to join you. Hirayama: I request that you take him too. Shinzaemon Shimada: But he is too young. Kuranaga: Shinzaemon, you're wrong. Devotion knows no age. A Samurai's life isn't measured in length, is it? Shinzaemon Shimada: My logic was shallow. (to the pupil) May we ask your help? Ogura: Thank you very much. I will surrender my life to serve you. "My logic was shallow." !?!?! This is totally contrary to the way I was brought up, which was more that life was precious and you shouldn't throw it away because of some foolish notions of honor and glory, or in some stupid pointless war dreamed up by some big shots who just want to throw their weight around. My mom was pretty much anti-military in all it's forms. Kind of crazy when my dad was building weapons. In The Hunger Games, there are a few contestants who are referred to as "careers". They have trained their whole lives for this event. They expect to win, and given the recent past, the odds are in their favor. Our hero is from District 12 and the people of District 12 have no such expectations. No one from District 12 has won for a long time. All they expect from the games is the death of their two contestants. So I am thinking things have changed a bit on how people in our society view war and fighting. Or maybe it's just that there are more people who view fighting as foolish and fewer people who care whether a death is an honorable one, or not. Or maybe we have just become a nation of cowardly women. Or maybe we have let women speak, and they are having an influence on the way we think. Or maybe this is just the natural evolution of civilization. If Cthulhu rode a motorcycle, this would be it. Grainger took this photo.This is one of the weirdest motorcycles I have ever seen. Drive wheel sticking out on the left, that's fairly normal, but that huge blob of the front end, with the front wheel just poking out, that's just weird looking. 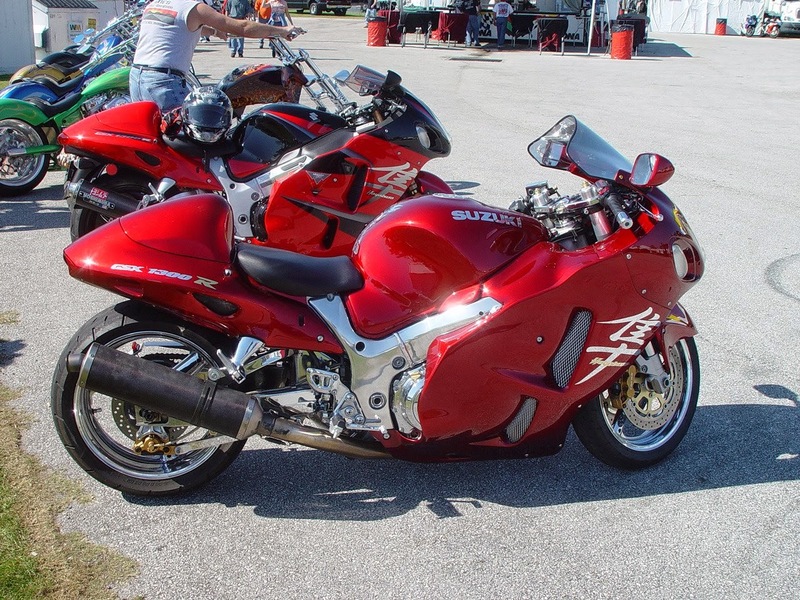 I looked for another photo of the Suzuki Hyabusa, one that had an uncluttered background, and none of them looked like this. They were all taken at a different angle, so the massivity and the blobiness are not so apparent. Just got back from going to see The Hunger Games. My wife liked it, my son hated it, I thought it was great! My wife insisted on my reading the book before we went to see the movie. I did that yesterday. It was an easy, enjoyable read. I had to wait my turn because her copy had been getting passed around among all the teachers at the school where she works. My only criticism of the movie is that they all looked too well fed. 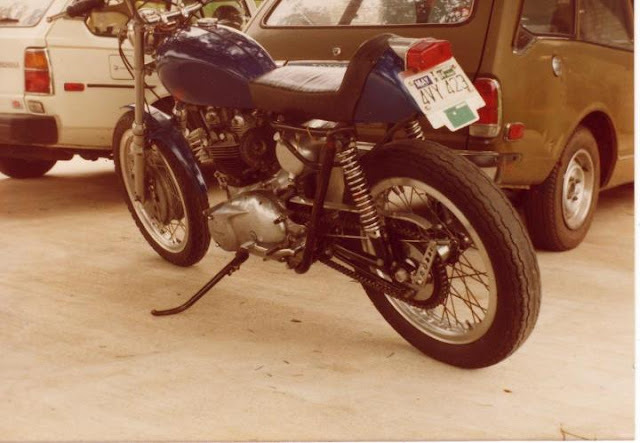 Once upon a time when I lived in Texas I had a motorcycle, a Triumph Bonneville. It was put together by a fanatic down in Houston. Ultralight weight, extra powerful motor. By the time I got it, the big motor had been replaced by a standard one, but it still had the lightweight chassis. I think it weighed less than 300 pounds as I was able to pick it up. Not far, mind you, but I was able to lift it off the ground an inch or two. 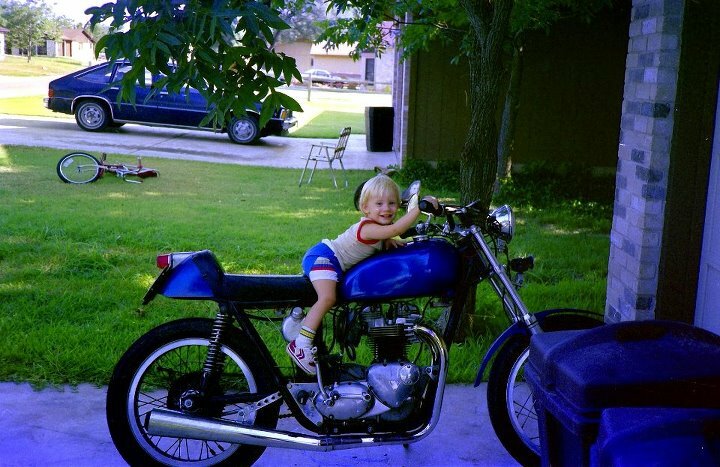 I remember it had a special four-leading-shoe front brake (off of an Italian bike, I believe). Very cool. Disk brakes had just started to make an appearance, they had not yet become ubiquitous. It also had two-into-one header, which is why there is no exhaust pipe visible on the left side (above). I bought it from a friend in Houston and took it with me when I moved to Austin to go to school. I rode it to school daily for a couple of years. I eventually sold it to another friend, name of Grainger. I recently got in touch with him again on Facebook. He posted these of pictures of it. This is Grainger junior after his dad repainted the tank and seat. Since (compared to cars) motorcycles have a higher centre of gravity:wheelbase ratio, they experience more weight transference when braking. It is obvious that the motorcycles nose dives under braking, but I had never considered that it would be any worse for a bike than a car. Though I did come up with an idea for an anti-dive brake link for bikes. Have to tell you about that one of these days. Jennifer Abel presents a good argument about why Obamacare is BAD IDEA. Like she says though, any connection between the law and the constitution is tenuous at best. The following is a collection of some somewhat disjointed thoughts. I think they are related. I have to go eat lunch now. Recently we've had some cases here in Oregon over people not getting medical care for their kids for religious reasons. The courts ruled against the parents. Advocates of science and modern medical care like to use logic, but sometimes I think the logic goes a little too far. I am a little concerned that modern medicine is creating a race of people who are dependent on modern medicine and are therefore weaker in a long-term evolutionary, survival sense. For instance, antibiotics have given rise to ever stronger strains of microbes. I would not be surprised if had a repeat of the Spanish Flu epidemic that occurred during WWI. Of course we don't need a new disease to kill a whole bunch of people. The old standards are still working just fine. Stevie Wonder wrote a song called Superstition where one of the lines is "if you believe in things, you don't understand, it's superstition". I like to say that I was raised in the religion of science, and by and large, I am a believer. But there are technological miracles that even I don't understand (like how an optical mouse works, or a transistor, or the reheat sensor in a microwave, just to name a few), but I have faith that somebody, somewhere, has done their homework and figured out the scientific principles necessary to create these modern day miracles. When I was a boy, my dad worked designing inertial guidance systems for missiles. Gyroscopes were a mainstay of inertial guidance systems. Gyroscopes are peculiar devices. You have undoubtedly seen toy gyroscopes hanging in midair, supported only at one end. They tend to walk in a circle, but can be easily restrained. When they stop spinning, they fall. Why is that? Gravity is the most pervasive of forces: everything unsupported falls. Why should spinning have any effect at all? These questions bothered my dad, so much so that he concocted a scheme to beat gravity with a sophisticated device that used the principles of a gyroscope. He eventually coined the acronym RIAR, for Radial Impulse Activated Reaction, as a name for it. He built a couple of models in an attempt to demonstrate the principle. It was something he played with in his spare time. In his later years he had a great deal of spare time. I remember the first model he made. I was still in elementary school. We lived in Seattle and he worked for Boeing. I remember the model was made of a board about a foot square with a largish (ten inch) hole through the center. A piece of glass was fastened to the underside. The sides of the hole were to provide a race way for some marbles, like a big ball bearing. This was back around 1960, when making things out of metal was still an expensive proposition. I don't remember any further progress on it. I think it was at this point that he realized that anything that acted in one plane was not going to cut it. If the device was to have a prayer of working, it would have to operate in three dimensions. Okaaaay, they disappear. Right. But this is fiction, and you can make up stories about anything you can imagine. Rotating something on all three axii simultaneously only results in the thing being rotated on one axis that is some average of the three. The three rotations are basically added together. My dad's idea evolved over time. Eventually the idea was to have a weight on the end of an arm that followed a convoluted path. It would swing through a 180 degree arc at a large radius. The radius would then shorten dramatically, the axis of rotation would change 90 degrees, and the weight would traverse another 180 degree arc at this shorter radius. The radius would then return to its' previous length, the axis of the rotation would change another 90 degrees, and the process would repeat. I think there were also some velocity changes involved. It was quite cool. However, he was never able to build a model that actually worked. I sat down one time and worked through the forces involved and half convinced myself that it would work. On the other hand, I never really understood why gyroscopes worked, and if I looked at my dad's concept another way it was obvious that it was never going to do anything. I still would like to understand gyroscopes. On the other hand, we still don't have a good explanation of gravity. My dad wasn't the only one was captivated by gyroscopes. YouTube is full of videos from inventors of anti-gravity gyros. I like this one, mostly because it illustrates levitation very well. The business about lifting it over his head with no effort, well, that's just showmanship. They used to use giant gyroscopes to stabilize ocean liners. Now they use swim fins. Excellent article on small group dynamics. Via View From The Porch. I saw this on WIMP.COM today. My first thought was whether this was the new billion dollar factory I had heard about earlier. (Turns out no, this one only cost a couple hundred million. The billion dollar factory is in Tennessee.) My second thought was to wonder whether you could build a slaughterhouse like this. Might be a little grisly, but so was Body Worlds. Found this on WIMP.COM the other day and the song got stuck in my head, so I thought I would share. Last fall I was on a cost cutting kick and I happened to read something about anti-depressants that said they only worked for six months, or they did their work in six months, or something. I had been taking Lexapro for years and it was costing me $60 a month, so I said, let's quit this, I don't need this stuff anymore. So I quit taking Lexapro. Then around Thanksgiving I went to the doctor about something, and that visit convinced me to stop taking Benadryl at night and my nasal spray in the morning. Johnny comes home at Christmas and I caught his cold, which predictably turned into a sinus infection, which resulted in my taking a couple of courses antibiotics and one course of prednisone. So I got shut of the sinus infection, or inflammation, but I wasn't sleeping very well, and I decided it was probably because I quit taking my anti-depressant, so I went back to the doctor and got a script for Prozac which costs me nothing. I hate to think what Lexapro would cost without insurance. Things got better, but I still wasn't getting enough sleep, so I started taking Benadryl again. I took two tablets last night and slept pretty well. Last week I paid a visit to Optimize Me! for an evaluation. They operate a unique bio-feedback system. They put electrodes on your head to record your brain waves, feed these into a computer which converts them into sound and then plays them back to you via headphones. The idea is that when your brain hears what you are thinking, it will adjust itself to provide the most harmonious thought patterns, or something. For the evaluation, they hooked me up to the sensors and recorded my brainwaves, but no headphones, no bio-feedback. They recorded brain waves for maybe half an hour, then they processed them, printed the results, and discussed them with me. The chart showed that some of brain waves are out of balance. Can't say as I am surprised. The "treatment" is time consuming and costly. It consists of two sessions a day for two hours each, one in the morning and one in the afternoon, with a two hour break in between. You do this for five days. If it worked, it would be well worth it. But no matter what anybody says, we don't know if it will work for me, and by work I mean I would start getting a good nights sleep every night. I think poor sleep is at the root of many of my problems, mental and physical. Daring daughter wants me to fly to Mexico city to visit with her for a weekend next month. I hate traveling. Well, I just realized the reason I don't like traveling is because I am always tired. Traveling takes energy, energy I could be spending on doing fun things, like eating donuts. If I was sleeping better, I would probably enjoy traveling. A couple of weeks ago my wife and I went to see Body Worlds at OMSI. Bizarre, interesting, and just a little grisly. On the walls there were some posters, and one of these posters said something to the effect that sleep suppresses the appetite, so one of the reasons people get fat is that they aren't getting enough good sleep.If I was sleeping better, I might be able to lose some weight. Shoot, this might be why so many Americans are so overweight. It's just like our parents said: we are over-stimulated and as such we aren't sleeping well. This also explains why most diets fail: they don't address the sleep issue. So put down the donut, chubby, and take a Seconal. Pavel Kahout wrote, among other things, The Widow Killer, a novel I am currently reading. He is quite a character, as this article by a compatriot explains. He was a Stalinist for a long time. Eventually he turned against the communists and got exported for his trouble. Amazing that he was not shot. On my way to get coffee this morning, I see a guy standing in the middle of the road. What's going on? Oh, big truck backing out of a side street. Hey, that's a really big truck. Nothing down that street but houses. Wonder what they were lifting that they needed a crane that big. Back when I was in college, I took a course in numerical analysis: how to do complicated mathematical calculations using a computer. Given my interest in math and computers, it should have been an interesting course, but somehow the instructor managed to make it horribly boring. It was a real struggle to stay awake, much less pay attention. I remember one day I made a big effort to listen to what he was saying and, surprise, surprise, the subject matter was actually pretty interesting. I don't know whether it was his tone of voice, or his manner or what, but it was absolutely my worst class. Course work was pretty straight forward. Given some data and a description of the problem, write a program in FORTRAN to compute the answer. All the really complicated stuff had already been written and stored in libraries, so it was just a matter of figuring out which functions to invoke and what data to feed them. For the last program for the course we were supposed to plot the path of an underwater sound wave. I remember it was a little tricky figuring out just how all the pieces were supposed to fit together, but eventual it ran and produced a nice, wavy line. Cool, it's complete, and I'm done with this class, and I didn't think any more about it. I had heard bits and pieces about the Navy's underwater microphone arrays, but this was the first time I had read a good explanation. Via Earth Bound Misfit. I'm reading The Widow Killer. It's a murder mystery set in Prague in the closing months of World War II. Hitler has just died and things are quickly becoming chaotic. People are picking up all kinds of weapons and a kid shows up with a panzerfaust. I have never heard of such a thing, so I look it up. Seems it's an anti-tank weapon. I should have guessed that from the panzer in the name. Wikipedia claims it was a more effective weapon than the American bazooka. The warhead was able to penetrate eight inches of armor. That's a heck of lot of armor, shoot, that's a heck of a lot of steel. I've been around a lot of steel construction, and you just don't see eight inch thick pieces of steel. Do you suppose that's why tanks are so heavy? The allies used some captured panzerfausts in operation Market Garden. First day of spring and it snows! OK, second day of spring, and it actually stuck. Ground was covered this morning. It's almost all gone now. Last week we had a pretty good wind and rainstorm. You can see some evidence of the wind in this video, but it doesn't really do it justice. It was gusting to 40 & 50 MPH. The shaky camera was all me, not the wind. Originally with reference to the fact that if one owed a penny, one might as well owe a pound, as the penalties for non-payment were virtually identical in severity. In Europe, a pound is the standard unit of currency in England, and only in England. How did this phrase find it's way into a novel (The Widow Killer by Pavel Kohout, page 177) written by a Czech, in Czech, about Czechs and Germans? Since I didn't read it in Czech, it must have been put in by the translator. However, to use a phrase like this must mean there is a phrase of similar meaning in Czech. I wonder what it is, and if it even has anything to do with money? Latin phrase I came across in a letter by great and wonderful Marc Randazza, who single-handedly defeated the evil Righthaven and their copyright shakedown scheme. Via Tam. Sometimes the march of technology gets sidetracked. Via Scott, the Post-Hip guy. Update February 2017 replaced missing video with one on the same subject. The decades around the turn of the 20th Century were a time of technological change that is hard to appreciate even when reading about it on the screen of a smartphone. In a relative eyeblink, the world went from whale-oil lanterns and horsedrawn carriages to electric light and automobiles. Telephones, automobiles, radio, powered flight: A seemingly endless stream of inventions were changing the landscape of the world, and among those dazzling gadgets were self-loading firearms. Maxim guns were starring in the tales of colonial wars and, with the development of early self-loading pistols, anybody could have this kind of H.G. Wells technology right in their pocket! When I got started in the computer business 30 years ago I made an effort to learn all I could about the hardware I was using: what all the pins on all the connectors were for, how to set all the jumpers, and how to program all the chips. I suppose that worked out okay for me but I soon got tired of it because I discovered that as soon as I had mastered something it was no longer useful for me to know anything about it. Either it had become obsolete, or the company had changed direction, or I had changed companies. After a while it got to the point where I only bothered to look up what I absolutely needed to know in order to get the job done. From reading Patrick O'Brian's stories about the British Navy during the Napoleonic Wars (round about 1800) I got the impression that technological progress up till then had been rather slow. Everything was staid, conservative "we've been doing it this way for a thousand years and we ain't gonna change on account of the whim of some whippersnapper". This was a very large and curious device. Note the man standing to the left of the brick pillar. There is no wheel and no crank, it just has a piston in a cylinder hanging on on one end of the beam and the pump hanging on the other. And it is not steam power that does the work of lifting the water. The atmosphere does the work. 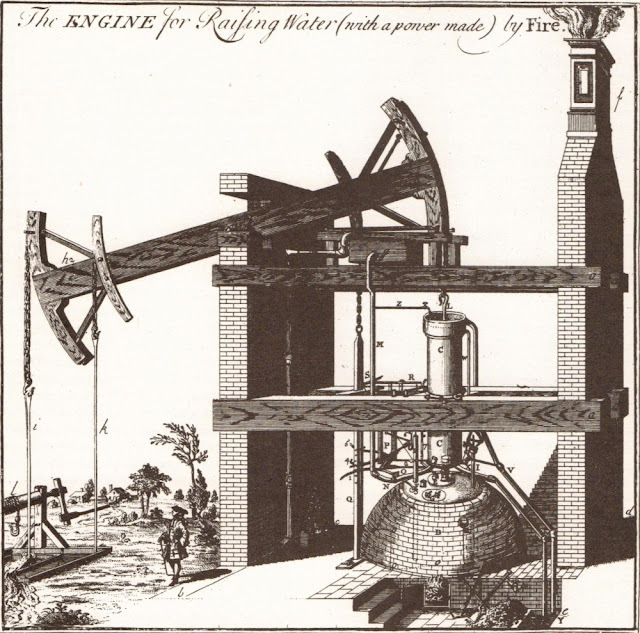 The steam serves only to raise the piston in the cylinder, and so lower the pump rod to take on a new load of water. When the piston has been raised (that is the position shown in the drawing), cold water is sprayed into the cylinder which causes the steam to condense, which forms a partial vacuum and the air pressure from the atmosphere pushes down on the piston, and so raises the pump rod and its' load of water. It must have been horribly inefficient, yet it still worked well enough that it got the job done. The water was pumped out of the mines, and the miners were able to extract ore. Even with the low pressures they must have been using, they still had trouble building boilers that would not explode. I suspect the problem was simply that the boilers were large. Since pressure is measured in force per unit area, it follows that a larger boiler with a larger surface area is going to be subject to larger overall forces. Steam power is only 300 years old. That is not a very long time given what we know of the history of civilization. In Sight - Organized Crime in the Americas, web site devoted to crime in Mexico, Central and South America. Just in case you needed some more bad news. Via Burro Hall. After a year and a half of stalling I finally got the gas fireplace in the basement repaired. I hope to relate that excruciating tale sometime soon. Meanwhile the fireplace is working and I have heat in the basement and I can dispense with the tiny electric heater I have employed in my office. Well, it worked for a day, and then it quit. Works if you turn it on using the switch in the base though, so there must be something wrong with the thermostat. But what could go wrong with the thermostat? I mean there's not much there, just a bi-metallic strip and a mercury switch. Maybe the wire broke, not because anything happened, but maybe during construction it got hit and it's just been hanging on by a thread. No, that's not it, put the meter on the wires and they're fine. It's got to be the thermostat, so I take it down and take it apart and check all the various contacts for connection and find nothing wrong. Put it back together and put it back on the wall and now it works. Grrr! Stupid thermostat. I think the problem is the same one I had upstairs: very light corrosion, tarnish really, on contact points. In this case I think it was the screw connections for the wire. I suspect simply loosening them and then retightening them would have been enough to fix it. This used to happen with old Multibus I computers when I worked at Intel. Okay, it happened once. Computer that had been running fine for a long time just up and quit. Took the boards out, polished the gold plated board edge contacts with a pencil eraser and put them back in and that fixed it. I suppose the reason I haven't had any similar trouble with my PC is that there aren't any additional cards in use, except for the memory sticks, and those get swapped out every couple of years or so. Or maybe they have some kind of new anti-corrosion technology. I thought this was going to be a nice, little murder mystery, with the added bonus of being placed in an exotic location. It turned out to be a lot tougher than that. We start out with the usual: a white male PI (Private Investigator) with a girlfriend. He has a friend on the police force. He drinks too much and the text is full of tough guy lingo. He gets drafted into a criminal conspiracy where he is way out of his depth and he has to find a way out. That's all the usual, but the setting and the way the tale is told make it altogether a much grimmer kind of story. 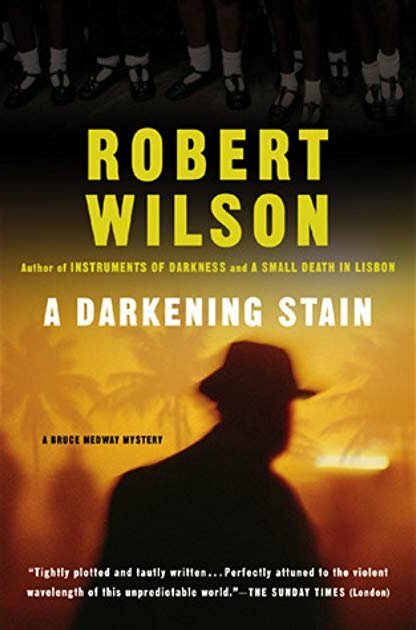 Instead of being set in one of the usual haunts like New York, London, or LA, this one is set in Cotonou, Benin (West Africa). I had heard of Benin, and I may even have known approximately where is was, but I had never heard of Cotonou. It's a sizable city, almost a million people, and just across the border from the center of the Nigerian 429 scam empire, Lagos. The entire coast along this section of Africa appears to be low lying land, swamps and lakes. This book was kind of hard to read, not because the sentence structure was weird or the vocabulary was unfamiliar, more because of the story. I would read a chapter or so and I would have to stop and let my mind recover from what I had just read. This satellite photo of Cotonou, Benin, shows an area about five miles wide. Update August 2018 replaced missing picture. I like George. I've seen a bunch of his movies. I think what I like is that he doesn't always play the macho tough guy. Sometimes he plays the other guy, the one who isn't quite as tough, or smart, or clever, or nice. In case you haven't heard he and his father and a dozen or so other people got arrested when they were protesting outside the Sudanese Embassy in Washington. Okay, we've got another celebrity making a fuss about some third world country. That's hardly news, seems like some celebrity is getting their face in the paper everyday for some kind of foolishness. I wonder if he is going to be able to get enough momentum to force any kind of change. Some people might want the US to send our military over there and straighten those ragheads out. I admit that's my initial reaction, but given the disaster in Afghanistan, I'm not so sure that's a good idea. (I don't know whether our involvement in Iraq was worthwhile or not.) The problem with Sudan is that they are supplying China with a considerable amount of oil, and anything that threatens to disrupt that oil supply is going to get China's attention, and I don't think we want a war with China. Other than a whole lot of people getting killed, it might disrupt our Walmart stores. Hell, can you imagine if trade with China got cut off? That would be a disaster for them as well as us. Yes, Billy, corporations are people too. We know this because the supreme court said so. So why aren't these sociopaths locked up? Maybe because they're too big to jail? Ha, ha, I made a funny. Except it's not so funny, is it? Can We Reform The Criminal Justice System? Everyone loves to complain about the way things are, me included. We complain about the government and the economy, politics and politicians, those people (whoever they are) of screwing things up for the rest of us. But has anyone come up with an idea that would actually change things? There was Prohibition and it's repeal. There was the Civil Rights movement. I think that changed some things. The EPA and the Clean Air Act have made a difference. I'm not sure how that happened. Did the hippies do that? The NRA is fighting an ongoing battle to restore our 2nd amendment rights and they seem to be making some progress. I just read about a new idea. I don't know if it has a chance in hell of succeeding, but I think it is surely worth a shot. The idea is to crash the criminal justice system by getting everyone who gets arrested to refuse to make any plea agreement and to insist on going to trial. Read Go to Trial - Crash the Justice Sytem in The New York Times. While there certainly are violent criminals who should be locked up, I suspect more damage is done to non-violent offenders than can reasonably be justified. Scott seems to have trains on the brain lately. This one has a pair of real, live steam engines pushing a snow plow and pulling a short train across the border between New Mexico and Colorado. Found this out when taking guay for a cold, felt like crap from my cold, but my hip pain was gone.. Ha! How do you pronounce Guaifenesin anyway? Goo-A-fen-es-in? Even the experts can't agree, Merriam-Webster has two different pronunciations. The 1955 edition of the Textbook of Pharmacognosy states: "Guaiacum has a local stimulant action which is sometimes useful in sore throat. The resin is used in chronic gout and rheumatism, whilst the wood is an ingredient in the compound concentrated solution of sarsaparilla, which was formerly much used as an alternative in syphilis." Andy's hip pain is from arthritis, previously known as the rheumatiz. And who knew there was a field called Pharmacognosy? Pharmacology I have heard of, but this is the first time I've heard of Pharmacognosy, and no, I don't know how to pronounce it either. I haven't finished Perdido Street Station, and technically it isn't set in London, but having just read The Difference Engine, the description of the city of New Crobuzon sounds very much like London in the 1800's, which doesn't sound much different than London in the 1700's in The System of the World, except for the addition of steam engines and calculating machines, which are under development in The System of the World. All three of these books paint a picture of a city that is just really gross and disgusting. Really makes you appreciate things like modern plumbing, sewage lines and the EPA. As usual, there are almost no pictures of the fabulous clockwork from the movie Hugo out on the web. Lots of boring pictures of the actors but virtually nothing of interest. I did find one on The Economic Voice. Hugo is a pleasant little story, but it also has fair bit about one of the pioneers of film making: Georges Méliès. Remember the Jarvik artificial heart? It worked off of compressed air and required that the patient/victim be hooked up to this big noisy machine. That was back when everyone thought that a pulse was a requirement. Surely a body that has been evolving for zillions of years would have gotten used to having a pulse and would even require it for some unknown function. Maybe we still do, but whatever function it serves, besides pumping your blood around has become less obvious since the advent of the turbo-encabulator artificial heart (the link goes to a really good Popular Science story). Most of the mechanical pumps we use everyday are rotary pumps. They have an impeller, or propeller or something that sits on the end of the shaft of an electric motor and spins at high speed (thousands of revolutions per minute (RPM)). There might be pulsations in the fluid being pumped due to the impact of a blade of the impeller, but they are minuscule in amplitude and much higher in frequency than the kind of pulsations you get from any kind of reciprocating pump, or a biological heart. Now there is an artificial heart in development that has more in common with everyday rotary pumps and not much in common with a heart. There were two concerns about using a rotary pump. One is the lack of a pulse, and the other is damage to the blood cells caused by the blades whirling around. Turns out neither one seems to be much of an issue. This new, and so far experimental, heart requires power, but it only needs a little electricity and that can easily be supplied by a battery similar to one from a laptop computer. It's small enough you can carry it around with you. Now we're getting into the realm of science fiction. This reminds me of Dune where the bad guy had heart plugs installed in all his minions. If one of his people displeased his, the baddy could kill him by simply pulling his plug. Of course, we have lot's of ways to kill people, and some of them aren't any more difficult than flipping a switch. Pulling the plug, I dunno, that just seems kind of slippery to me. "As many as five million Americans suffer some form of heart failure, but only about 2,000 hearts a year become available for transplant." I kind of doubt that all five million are candidates for an artificial heart, but there is certainly a market for thousands per year. I got to thinking about the Eternity II puzzle again this week. I've made several previous attempts at solving it, but they have all gone down in flames. This time my idea this time was to build up one edge of the puzzle, that is 16 square tiles all against one side. Build up one edge, and set it aside. Then build another edge, and another. Build all possible edges, and then when you have a complete set mix and match until you find a set that will make a complete square. That is it will use all four of the corner pieces and all 56 of the edge pieces, and it will use each piece only once. This depends on being able to generate all of the possible complete edges. That should not be too hard. We have 56 edge pieces, and 22 possible colors, so that's something less than 3 possible matches for each piece. We have to find 15 edge pieces and one corner piece to build a complete edge. So that is like 3 to the power of 16. 3 to the 4th is 81, 81 squared is just a little greater than 6400 (which is about 3 to the 8th). Square that again gives us 3 to the 16th. 6400 squared is 64 squared times 10,000. 64 squared is 4096. Call it 4,000. So 4,000 times 10,000 is 40 million. So 3 to the 16th is roughly 40 million. I have a computer that can do a billion operations a second. It should be able to crank this out in short order. I've been thinking about this all week, and last night I finally dug out some old code that could be made to do this job with minimal modification. This morning I beat it into shape and fired it up and it ran and ran and ran. Hmmm. Something is not right. It has gone way past 40 million. What's going on here? I go back and look at the index I generated and I find the problem. The sneaky devils who designed this puzzle didnot use all 22 colors for the edges between adjacent edge pieces, they only used five. Which means that for each piece there are 12 possible matches (60 divided by 5), not 3. So the total possible complete edges is more like 12 to the 16th power, which is like 100 Quintilian, which is a billion times bigger than 40 million. So million, billion, quintilian, we've got a lightning fast computer, it should be able to handle this right? Well, maybe so, maybe no. Say it can do a billion operations a second. Then it can do about 100 trillion operations a day, or 10 quadrillion operations a year. To perform a 100 quintilian operations then would take ten thousand years. Now if you got really fast computers, and optimized the code you might be able to cut the problem down by a factor of 10 or even a 100, and if you got a hundred computers to all work on the problem together you might be able to generate all possible edges in a year. But that is only the first step. You still have to sort through that list of a 100 qunitillion edges to find a complete, unique set. That's going be even worse. And then you still only have the outside edge of the puzzle. This is not the way to go. "We spoke of Mr. Hooke's observations of snowflakes - their remarkable property, which is that each of the six arms grows outwards from a common center, and each grows independently, of its own internal rules. One arm cannot affect the others. And yet all the arms are alike." Baron Von Leibniz speaking to Daniel Waterhouse in the novel The System of the World by Neal Stephenson, page 695. I have oft heard the old saw about how no two snowflakes are alike, and I have often observed that all six arms of a snowflake are alike, but it never occurred to me to consider how that happened. Mr. Hooke refers to Robert Hooke. My son gave me a copy of Neal Stephenson's latest book - Read Me, so I was finally free to read his last book which I had been saving because really good books are few and far between, and I always want to have something in reserve, you know, just in case no more good books ever show up. Courtesy of the Church of the FSM.